The AA is the most trusted brand in the UK. After founding in 1905, it quickly became renowned for its expertise and commitment to customers, with its services covering car insurance, driving lessons, loans, motoring advice, and breakdown assistance. 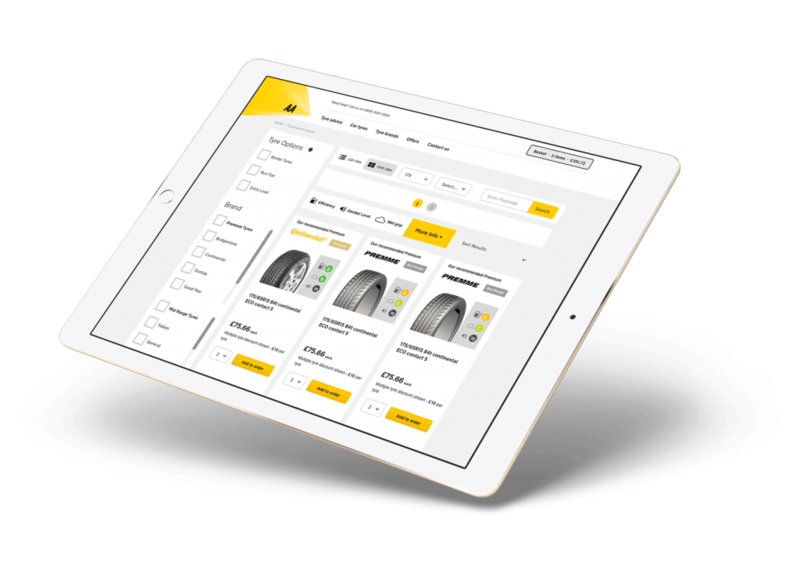 For its mobile tyre fitting service, the AA required a responsive website which would allow its customers to place tyre orders online and have them fitted at a location of their choosing. The company wanted a bespoke website to manage these objectives. The bespoke site had to represent the AA brand and its core values of motoring expertise and customer commitment. At the same time, it had to provide exceptional user experience (UX) to guarantee an intuitive purchasing process for customers. We spread the challenges posed by the project across three main areas: design, technical, and UX. These key aspects had to come together seamlessly to ensure the user journey was streamlined in order to maximise sales and ensure the service launched to immediate success. The mobile tyre fitting marketspace caters for a diverse range of new and existing customers, from enthusiasts who know the brand and type of tyre they want, to those who know little or nothing at all. It was essential each user persona had a clear and concise journey through the website and at each point never felt overwhelmed or confused with the information being presented.Our goal was to ensure they were informed and empowered. To achieve this we performed extensive market research into the mobile fitting sector, prototyping, innovating, and wireframing various ways to present and refine the products and data. This ensured the process to find and filter tyres throughout the site was as organic and natural as possible. Overall, the number of sales online via mobile and tablet surpass those of desktop devices. Our responsive web design and development (mobile first) approach allowed us to focus on presenting a native style experience to those customers on portable devices. This not only provides them with a better UX, but also results in a higher conversion rate and increased revenue. The business objectives which drove the technical developments were primarily focused on real- time data and logistics. Behind the scenes, the site was developed to manage the synchronisation of a huge amount of stock, its availability, and the cost, all of which is spread over multiple warehouse locations. This data is then cross referenced against the mobile installation fleet to create real-time cost and availability. This means, when customers come to book a date and time for their fitting, they’re presented with options which are possible to achieve on an operational front. We developed custom APIs and data synchronisation tools built on a Symfony framework to ensure the site was not only rapid in response but scalable for handling vast sums of data flowing real-time against large bursts of traffic. Customer satisfaction is paramount so it is essential all data remains accurate - from vehicle lookups to product pricing and availability. With a diverse audience we provided market reports, advice, and suggestions on site behaviour and conversions. In the highly competitive mobile tyre fitting industry, it was essential to come to market with an eCommerce site which stood out amongst competitors. This didn’t mean an on-trend design merged with gimmicky navigation. Instead, we developed a clean and clear interface with a streamlined checkout page design. We wanted to innovate by breaking down the process of searching and buying tyres and we did this through a succinct process which guides and informs the customer at relevant points. From our research, we found the majority of purchases in the tyre sector are driven by recommendations, whether offline, at a tyre depot, or in the online space. Consequently, it was essential we present suggestions to users with relevant, data-driven recommendations which represent the best value and quality against their criteria. With all our clients we act as an extension of the in-house team, providing advice and support across our range of services, from reports on user behaviour to marketing data and CRO test results. We translate data into meaningful, actionable suggestions which facilitate market growth.